For over 150 years, the medical community has both intensely studied and perfected ozone therapy in patients all over the globe. Considered by the many an “alternative therapy” to treat wounds, disease, and various infections, ozone therapy was cast aside and suppressed for many years with the emergence of the pharmacological and diagnostic verticals in medicine. Despite this deliberate suppression, ozone’s effectiveness is well documented and is a commonly used treatment for hundreds of diseases and infections in various parts of the world. So what is ozone therapy, you may ask? According to Drs Gerry Buchoff and Judith Shoemaker, “the physiologic actions of ozone are many, the simplest of which is to provide sufficient oxygen to allow complete oxidation of sugars and other fuels to produce sufficient energy and to “burn clean” to CO2, water, and inert end products.” In layman’s terms, ozone therapy is the increase of oxygen in the body by adding ozone via various methods, such as intravenously or autohemotherapy where it is mixed with a blood sample drawn from the patient. 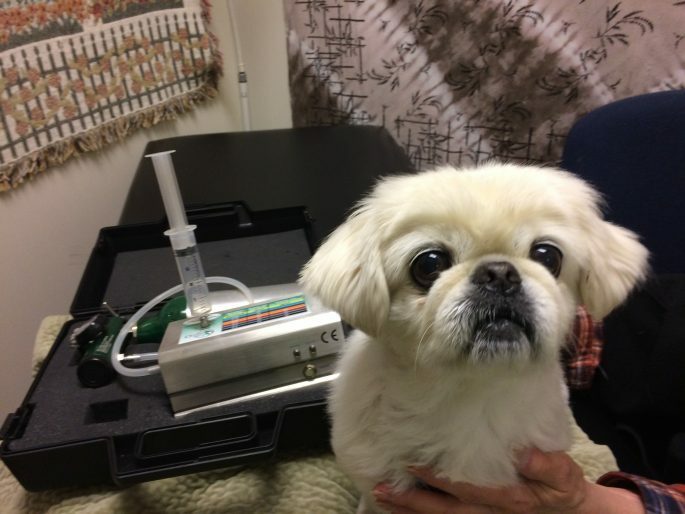 Now that you better understand what ozone therapy is, how can this benefit your furry friends? Just like the human body, proper oxygen is needed for cell growth and repair in animals affected by various ailments. Healthy cells are surrounded by an enzyme coating that protects them from free radicals, which ozone is not able to penetrate. The ozone helps to strengthen these coatings to further promote cellular immunity. However, certain bacterias and viruses do not have protective enzyme coatings surrounding them, and are oxidized on contact with the ozone. Ozone therapy has been proven extremely safe and free from side effects for your pets. Ozone therapy is still heavily debated by both the human and animal medical communities as to its effectiveness and necessity in treatments. It is important to consult your veterinarian if you feel that ozone therapy may be beneficial for your pet.